Vegetables at the supermarket are typically trimmed and topped, with no dirt smudges or leafy tops remaining. But if you belong to a CSA, grow your own produce, or buy vegetables from a farmers' market or farm stand, your vegetables are more likely to wear their leaves long. That's a good thing, because veggie leaves — with the notable exception of rhubarb — are generally nutritious and full of flavor. [%image feed-image float=right width=400 caption="Gattina's unusual quiche."] 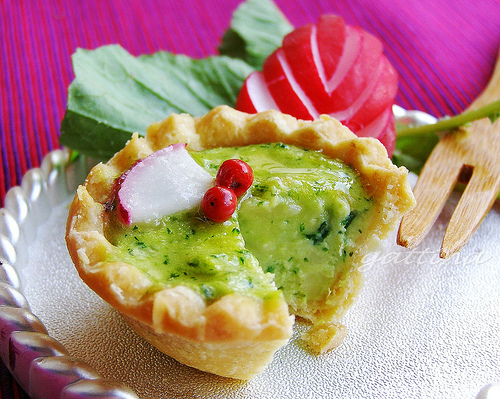 Gattina, of the food blog Kitchen Unplugged, recently made a radish leaf avocado quiche, which she said was very tasty. Meanwhile, Alanna Kellogg, of the food blog A Veggie Venture, cooked up a satisfying soup last fall that favored the whole beet — leaves, stems, and all. The University of Florida has a partial list of common edible veggie leaves, including the leaves of sweet potatoes, turnips, and broccoli. And Ivy Manning has written about eating your leafy greens on Culinate, offering such recipes as Bacon-Braised Turnip Greens and Beet Greens and Feta Phyllo Pockets with Yogurt Dill Dip.